Even on days in the recent weeks when the weather has been frightful, I dream of sunny days. Warmer days, when I can sink my hands into the earth and press tiny seeds into the cool dirt. Days where I run to the store for packets of carrots and kale and zucchini. On the rare occasions when we have had temps in the 50s, I continue to work in the garden, building my layers, while visions of plump red tomatoes and crunchy garden peas pass through my mind. In the meantime, I hope all those polar vortexes and crusty ices and gray snows are killing every single squash bug around this place. Me, too! The bitter cold should be good for killing bugs! From what I have seen, the various bugs and spiders seem to have antifreeze in their bodies. They will dehydrate if trapped inside where it is warm. I thought that they might delay school today but no. I'm dreaming of digging in dirt again! great photo, it'd make a super watercolour...or quilt design. FWIW, it's been in the low 70's here the past couple days. It's been wonderful! I'm chanting MELT! MELT! MELT! I hope it's going to be a good growing season. We are the opposite of many places. We have less moisture than what we need. I actually had a spider walk over my hand Sunday while driving back home. Perhaps the warm in my car all day rejuvenated him, and I deleted him sending him out the window. The photo is too cute! I love the row of boots representing the family. :-) At least we're halfway through February--spring is coming! The one positive thing about cold weather is that it does help get the bug population under control. Our garden is still buried in snow. I haven joyed the garden displays that are popping up in stores :) reassuring that Spring will come, eventually! Soon those boots will be replaced with flop flops and...well...nothing. Keep up the happy thoughts. We are supposed to get to 48 today. Usually we have at least one good snow in the first half of March, so I figure winter has a ways to run yet. That's one good thing about the ultra cold winter we've had this year. We don't have the number of bugs around that we had last year! I had to laugh because I've been hoping for death also-for all the fire ants! Spring is coming, spring is coming!!! het is toch allicht ergens goed voor.tenminste dat is te hopen. Lol. I like how you found something positive in all this chaos. That's the one thing this deep freeze will be good for - killing the bugs! I can't wait for warmer weather. Those boots will soon be needed for the mud during the "big thaw"! I'm with you...hoping this cold weather did some good and killed some of those bugs! I'm not much of an outdoorsperson, but I do enjoy not having to run to the car to get out of the cold! Of course, it goes from 20 degrees to 90 degrees and stays that hot from about May to October, so I'll be missing the cold soon enough. Haha, I'm hoping the same for the bugs. We're finally warming up so we'll soon see how many critters survived. HA! 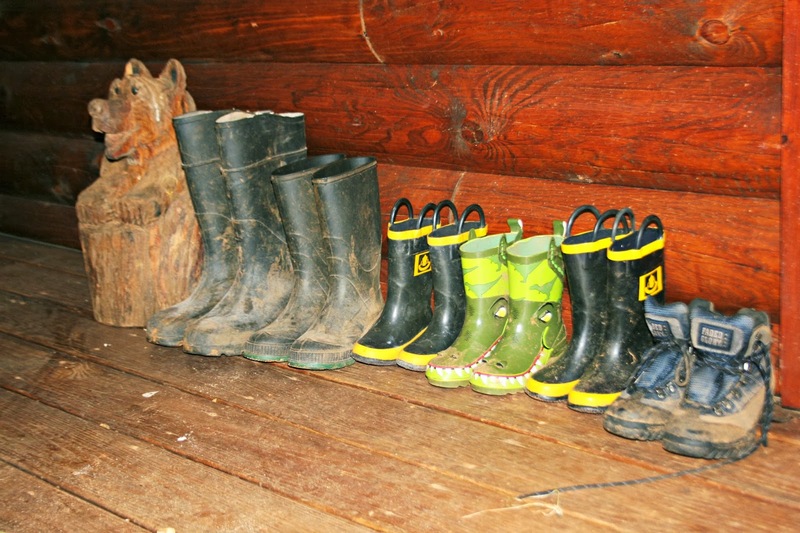 Only two people in this house and our boots all stand at attention next to the door too! Cute pic! I imagine the earth is happy with all this snow and moisture this winter. At least it will be a good soaking to get ready for spring flowers and plantings! We feel the same way you do about those bugs and stuff,,, they always seem to survive! What a great collection of boots! We are ready for spring here too. A great themed photograph, Lisa. My family up north is ready for the snow and ice to disappear. Spring will arrive before you know it! Hope Spring comes soon for you. I'm sure you are sick of bundling the boys up in their snow suits and boots! I've been following your weather on tv and feel for you -- enough already! Feeling your pain...we need a change of season here, too. It's been a long winter. love the picture. It's so sweet. I'm also dreaming about all of the fresh veggies and fruits.